Life has been kind of extra stressful around the Hall house for a few months now (since February). I learned awhile back that I have a tendency to lump a string of events together and let them inundate me. But I have been trying to keep things in perspective, making sure to take and deal with each thing as it comes, and try to leave the last thing in the dust. I think I've been handling Mark's two dialysis access (fistula) surgeries, a five day hospital stay, his blocked iliac artery, a nasty sore on his left big toe, more than a couple of emergency room visits and adjusting to an income loss basically OK.
We left a little bewildered by the suggestion that Mark will probably need two more procedures, one to get his fistula back to a stronger flow and another to amputate his toe. We didn't make any decisions in the doctor's office. We told him we need to digest this idea and call him in a few days. Thankfully nothing is emergent, so we can take some time. We left and moved through the rest of the day pretty normally. We did talk a little about it that night, but began the next day like always. I was determined to not let it overwhelm me. And then, pulling weeds, of all things, tipped the scales. Yeah, there's a grill and a wheelbarrow in there. I'm so embarrassed. I was in the front yard, pulling some weeds and grass out of our little strip of "decorative" plants when it hit me. I hate these stupid weeds! Pulling them is only a temporary fix. Why do I even care? 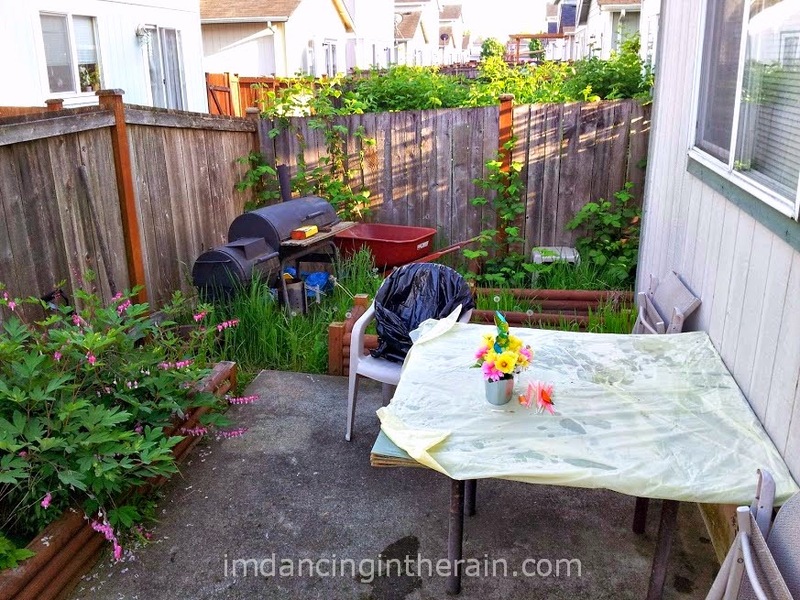 I hate the dirt, I freak out a little every time I see a worm and since the weeds are such a problem I would argue that it's not even adding much beauty to our yard. Why the hell am I doing this? Mark and I are already fighting a losing battle with his health. BECAUSE WE HAVE ENOUGH TO DEAL WITH THAT ISN'T SIMPLE. So I took off the gardening gloves, threw my bag of weeds in the trash and stomped inside to take a shower, feeling defeated. We took one step forward after Mark had his iliac artery angioplastied and stented. His left leg feels better and more blood is getting to his toes. He's obsessed with his new cane making hobby. I have felt so happy for him and relieved to have a bit of room to breathe. But two more surgeries looming feels like two steps back. I suppose this is the nature of chronic illness. And I guess today it wins.